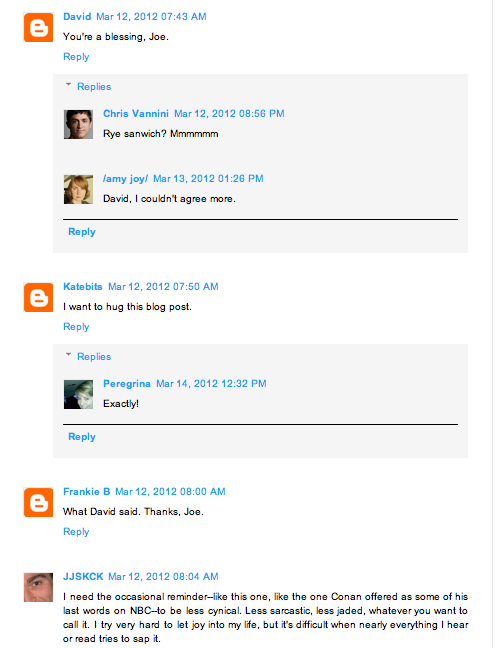 A few months ago, Joe Posnanski disallowed comments on his blog, one of the few blogs I consistently frequent. Normally, I don’t read too many comments, aside from perhaps the first five or six after a story on most website, and I rarely comment on any piece of work. Posnanski’s website is different. I always read the comments, and I’ve commented a few times as well. But, yes, a few months ago, Posnanski removed the comments section from his blog. He was justified for doing so. In a post, he wrote about a particularly malicious comment he had to delete, which the commenter then just rewrote no more than a few minutes later. He decided to suspend the comments section because he wouldn’t have time to moderate. A blog without comments is like an SNL episode without “Weekend Update.” It just doesn’t happen. His readers realized this. A few apparently VOLUNTEERED to monitor the comments for him so the section could return.